Fished IRI friday night into Saturday. Had a few shorts to 20" and then right around false dawn got slammed. Fought her for about 5 minutes and when I got her in and went to grab her she rubbed the line on a rock and was gone. Fish looked to be a solid 30+lb. Damn you got me kurazy! I fished the other inlet in Delaware. Not a touch. Talked to some guys throwin' bait all day and they said they had nothing either. Black Drum caught on a VA BI this weekend. I was on AIMD for about 7 hours Sat, 3 skates, birds and dolphins about 200 yds out. Things are starting to "come back to life"! Any reports of blues in the surf yet on AI? Just got back from the beach. Fished IRI Sat for 4 hours, NADA. Cast bucks and swim shads, Nada, skunked. Water was rough, lucky I had a rain suit to wear. got splashed a few time's .Looked like some of the early morning waves near the light tower were at least 7' high. But it was great to be there. Now to plan the next outing. You mean Marty, if not , Look up his treads. He was the best striperman. April fools. Really look him up for some great entertainment of BS. 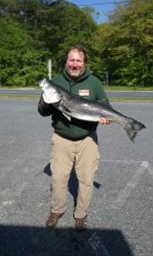 Fished an inlet in Delaware Saturday 4/6 and Sunday 4/7. Caught 5 stripers 15" - 22" on small swimbaits. Low tide seemed best. Quick bite window but when it was over... it was over. Great weather on Sunday. I called Buck's place yesterday because my wife wants to go to AI to catch bluefish tomorrow and I wanted to see if anyone was actually catching any blues. The woman who answered the phone said there were some blues being caught...but sometimes people at tackle shops just say that. Can anyone confirm the rumors before we make the 4 hour drive? Thanks! Shad are starting to show up in some places. Not a lot, but it sure was nice to catch something!